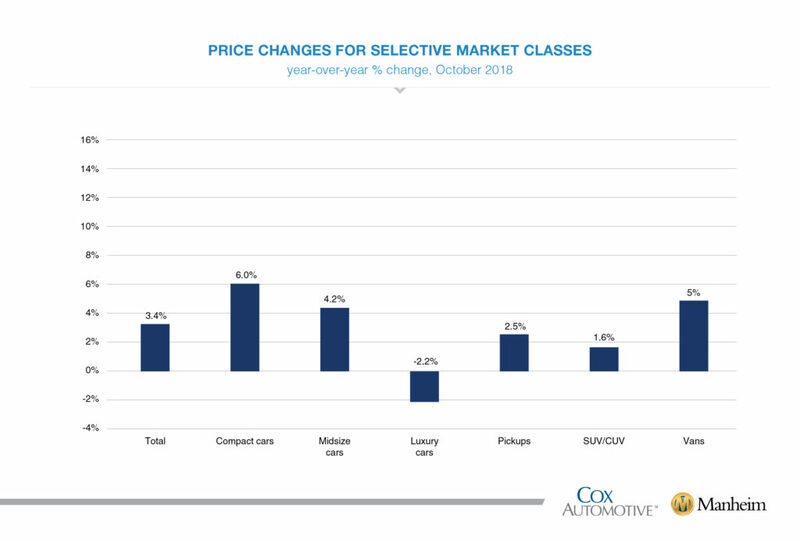 Used Vehicle Values Increase Again for Record - Cox Automotive Inc.
Wholesale used vehicle prices (on a mix-, mileage-, and seasonally adjusted basis) increased 0.72 percent month-over-month in October. 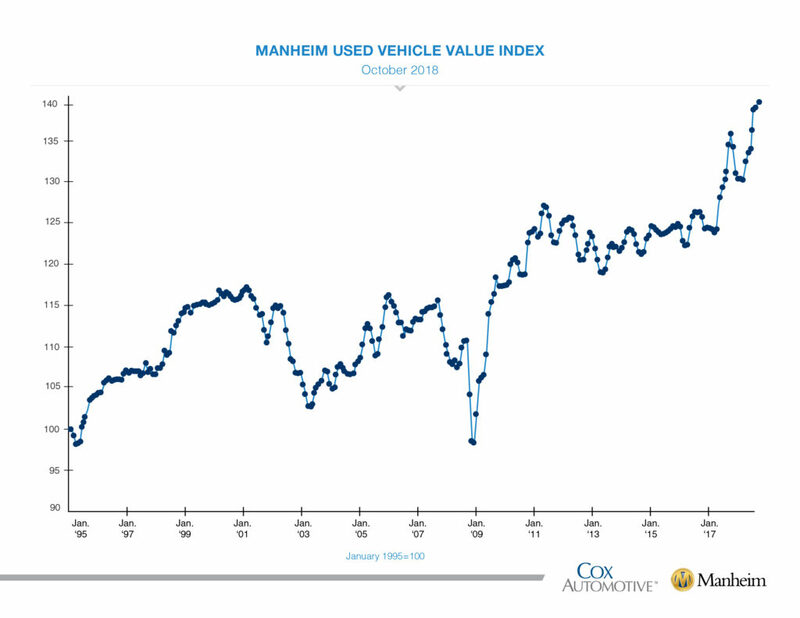 This brought the Manheim Used Vehicle Value Index to 140.9, a 3.4 percent increase from a year ago and a record high for the Index. 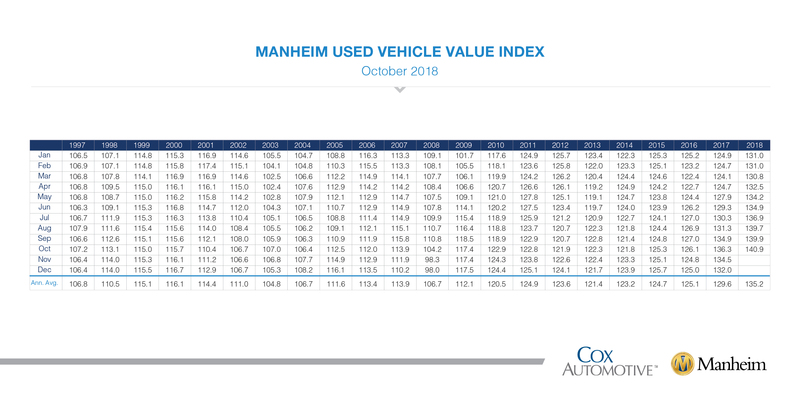 Looking at trends in weekly Manheim Market Report (MMR) prices, October saw continued normalizing depreciation. Even after that normalization, 3-year-old vehicles ended October worth 3.5 percent more than they would normally have been worth had typical depreciation occurred instead of the abnormal appreciation observed this summer. On a year-over-year basis, most major market segments saw price gains in October; but more affordable vehicles are seeing the greatest increases in values. Compact cars and midsize cars outperformed the overall market, while utility vehicles and pickups underperformed the overall market. Mixed results for vehicle sales in October. According to Cox Automotive estimates, used vehicle sales volume was down 0.3 percent year-over-year in October. The annualized pace of used vehicle sales was up almost 1 percent over last year, led by franchised used vehicle sales (up 1 percent in October on an annualized basis) and private-party used vehicle sales (up 2 percent in October on an annualized basis). We estimate the October used SAAR to be 38.1 million, down slightly from 38.2 million last October. October new vehicle sales were up 0.5 percent year-over-year, with one more selling day compared to October 2017. The October SAAR came in at 17.5 million, down versus last year’s 17.9 million. Cars continue to see sharp declines as sales in October fell 10 percent compared to last year. The market share for cars rebounded to 30.5 percent after being below 30 percent the previous two months. Light trucks outperformed cars in October and were up 6 percent year-over-year. New vehicle sales year-to-date are up less than 1 percent versus last year. Fleet has been the driver of the strength in the new vehicle market year-to-date. Combined rental, commercial, and government purchases of new vehicles were up 2.8 percent year-over-year in October; but fleet sales were flat on a month-over-month basis. Commercial (+10 percent), rental (+0.2 percent), and government (+1 percent) fleet channels were up year-over-year in October. Fleet sales are up 7 percent year-to-date versus last year. New vehicle inventories came in under 4 million units for the sixth consecutive month, but inventory levels are at their highest level since June 2018. Rental risk pricing strengthens. The average price for rental risk units sold at auction in October was up 4 percent year-over-year. Rental risk prices were down 4 percent compared to September. Average mileage for rental risk units in October (at 46,500 miles) was up 9 percent compared to a year ago and up 5 percent month-over-month. Continued strong economic momentum. Job creation accelerated to 250,000 in October when analysts had expected 200,000; the prior two monthly numbers saw slight offsetting revisions resulting in no change in total employment. The average monthly job creation year-to-date 2018 of 213,000 is well above 2016 and 2017. The headline unemployment rate remained steady at 3.7 percent, the lowest level since December 1969. The underemployment rate declined back to 7.4 percent after temporarily increasing last month. Labor force participation also increased. Average hourly earnings increased for a 3.1 percent year-over-year gain, the highest increase since the recession.